How to Import to Laos? How to import to Laos? What are the import procedures in Laos to move goods? Explain about import registration process, cargo movement to Laos from overseas countries, Import delivery process in Laos etc. Detail the import methodology in Laos. This post explains about step by step procedures that need to be finished with Laos government authority for importation to Laos. If you are an importer wishing to import commercial goods into Laos you must be register a company with the Ministry of Industry and Commerce Department of Enterprise Registration and Management. Lao Customs is the official customs authority with the responsibility of managing and overseeing the flow of goods, collecting import and export duty fees, controls smuggling & illegal trade and is facilitator of genuine trade. 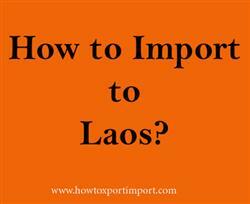 This post explains about different phases in import process that every importer needs to go through in Laos. How to import to Luang Prabang? Formalities for import to Pakse. Procedures to import to Vientiane. Need to import to. Luang Prabang. Explain to import to Pakse. Information to import to Vientiane. Step by step process to import to Luang Prabang. Methods to import to Pakse. Guidelines to import to Vientiane. Please guide to import to Luang Prabang.